Libby is the Mom of REI Berkeley, and last month she invited some ladies over for a pie crust workshop. She claimed to have the best pie crust in the west, and was kind enough to show us the ropes. It was a fantastic evening, and felt like we were in a Food Network program. I will try to put into writing what Libby does with her crusts, but it will not compare with the real deal. Libby originally got this recipe from a neighbor back in the 70's. She still has the original recipe written down. Her best advice was to get in the right space for making the crust, relax and don't get frustrated. I no longer am afraid to make pie crusts from scratch, and neither should you! This crust recipe makes enough dough for a two crust pie, like peach, so cut in half if you just need enough for a pie/quiche without a lid. 2 C white flour, unbleached, leveled with a knife - no fudging! Start by prepping your ingredients and your work surfaces. The key is to keep everything very clean and dry. If you have a large wooden cutting board, it is perfect for working the dough. A nice clean rolling pin is key as well. Prep your butter by setting it out, and your water by putting it on ice. Preheat oven to 400 degrees. Measure your flour into a bowl, and add the butter, sliced. Use two knives or a pastry cutter to cut the butter into the flour until it is about pea sized and pretty uniform. Gently fold in the water. This helps set the butter so the dough is workable. Next massage the dough together until it is an even consistency. Take half and set aside. Pat other half into a ball and set on a well floured work surface. It helps to also cover the ball with flour. Using a well floured rolling pin, roll out the dough until it is large enough to fit in the pie pan. Tease the dough up off the board or counter with a spatula, or roll out on parchment paper so you can flip the crust onto the pie pan. A 9" deep dish pie pan is best, and apparently metal is better than glass as well. Pinch dough around the edges of the pan to form the crust. Prepare your filling* and put in the pie pan. Then repeat for the second half of the dough - rolling out and then placing on top of filling. Pinch edges again to form the crust, and poke decorative holes in the top. Sprinkle with sugar and bake for 55 minutes or until crust is golden. 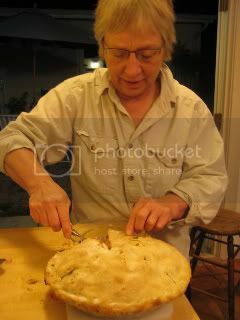 I also recommend placing a pan or foil under the pie while baking, because juices usually bubble out of the pie. *For a filling, I recommend peaches, especially in the summer. Wash well and dry 8 peaches (not too ripe), and slice into uniform slices. Mix (with your hands) peaches into 1/2 C sugar (more or less for tartness or sweetness), and dashes of cinnamon, plus 3 Tbls flour to thicken.